5 Exercise Pull Bands: 10lbs to 30lbs Workout Bands, Stackable Up to 100 lbs . Yellow-10lbs, Red-15lbs, Blue-20lbs, Green-25lbs, Black-30lbs, can be used alone or stacked in any combination to a maximum equivalent of 100 lbs, perfect for Resistance Training, Strength Training and Home Workouts. 8 Type Resistance Band: Our figure 8 pull bandisdurable and elastic,a perfect workout tool for stretching, muscles toning, yoga, Pilates and physical therapy. Ideal for strengthen your legs, arms, glutes, shoulder. 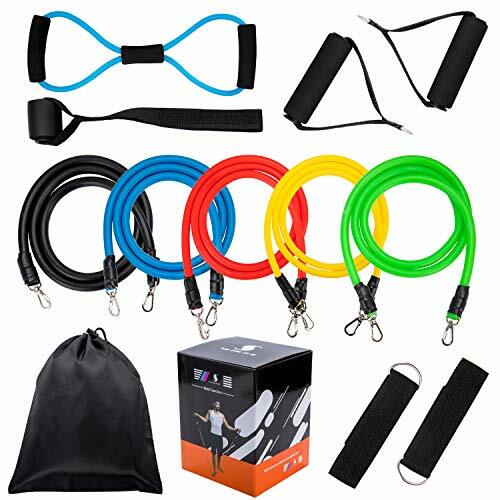 Use at Home or Gym: This heavy duty resistance band set includes a door anchor and two ankle straps to allow you to perform the widest variety of resistance training. Great for toning your chest, abs, biceps, triceps, quads, glutes, buttocks and more. Durable &Safety: Made of high quality natural latex and durable nylon, the bands are able to maintain the maximum resistance levels even after repeated stretch and use. Perfect to continue PT at home!